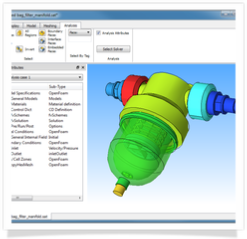 DHCAE Tools’ solver technology adapts to the user’s needs and overcomes open source deficits. Our solutions are highly flexible in the workflow as they also work on Windows OS. Our software is very consumer friendly as it offers GUIs and is not text file based (like in a Linux environment). There is no need for detailed knowledge of a job control language or of Linux. 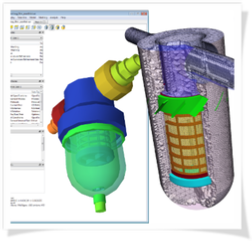 Our solution is very time-efficient as meshing and case setup is easy and user friendly. Our software eliminates errors by no usage of a command language. We offer additional functionalities, e.g. coupling of fluid with strengh. Our job control is highly reliable in obtaining correct analyses’ results. Open source solutions offer considerable cost advantages, requiring no annual licensing fees. With their source code disclosed, these standard solutions are customisable and expandable for own problem definitions and for the individual company workflow. Open source solutions are constantly available for short-term increased need for computing capacity. Standard open source solvers require a defined workflow including the knowledge of the solver language and of Linux and of a textfile based working on the basis of STL geometry input. Due to constant revision of methods by universities and research institutions, open source solutions have quite rightly a high reputation. CFD simulations results are very reliable, stable and accurate. We offer our capability and expertise to develop the open source code further, creating tools that are tailored to our customers’ calculation needs.